One of the most common water claims we see are related to the water heater. 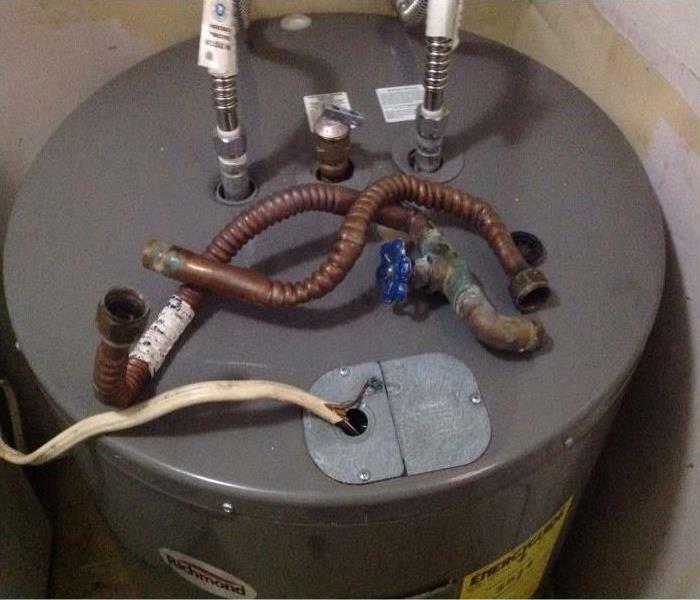 Common issues are that the release valve malfunctions and comes off, the bottom of the water heater rust out, the copper lines freeze and burst or in this case the copper lines simply came apart due to age likely from minor moisture over time. Water heaters have a life expectancy and should be checked. 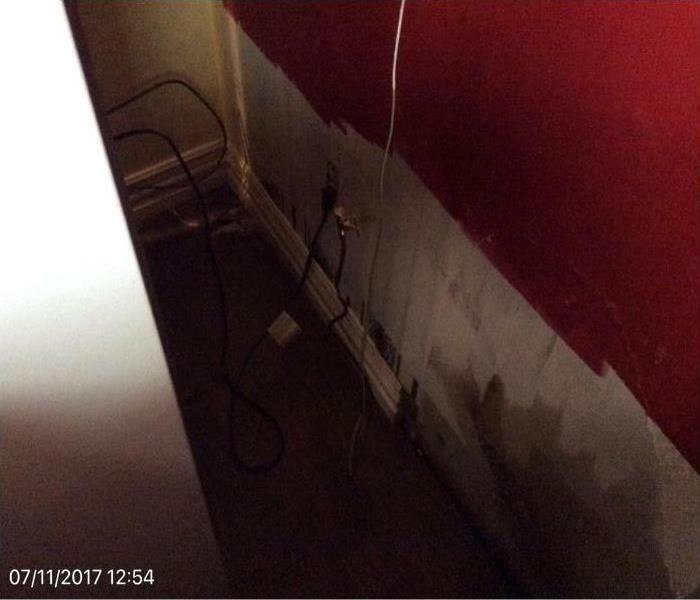 Have you ever thought about checking an adjoining room for water damage. The theory is true, wet goes to dry. Fortunately, the customer for this job in Cave City, Arkansas did just that. They had pulled back the carpet prior to our arrival. As you can see the subfloor up against the base trim is wet. This garage had a fire loss that burned through the roof decking and into the shingles in Jonesboro, Arkansas. At SERVPRO of Jonesboro we provide all types of roof tarps. 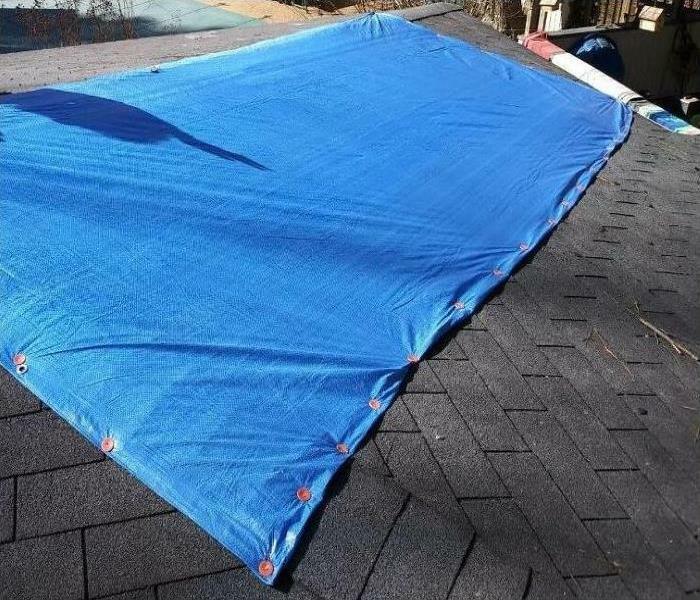 Tarps will generally provide a temporary repair until the job can be fully reconstructed. Often times basements or low areas of a home have a sump pump to remove any excess water that may enter the structure. It is very important to have these inspected periodically. 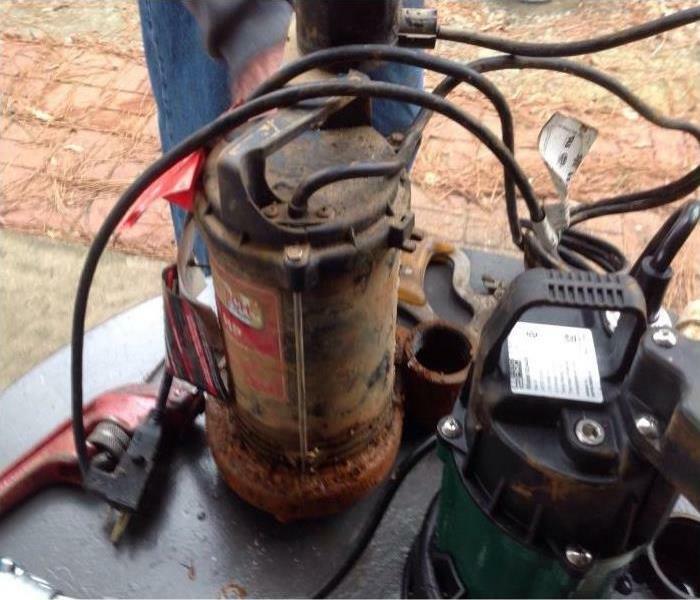 This is a sump pump that failed during a recent flood. 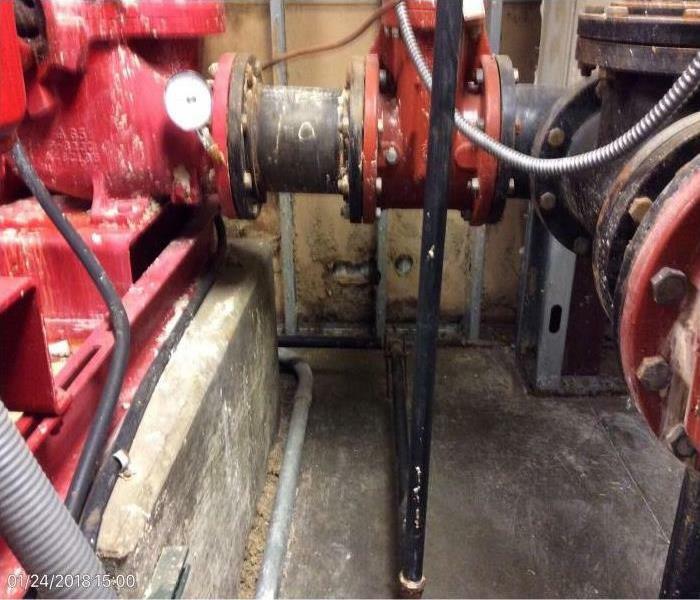 Because the pump didn't function as it should have the basement took on several inches of standing flood water that caused a significant amount of damage. You can visually see that this base trim has been affected by water damage. It has absorbed the moisture into the wood. The base trim in this instance was removed from the drywall so that adequate airmovers can dry the drywall and trim (if it is to be salvaged). Some base trim is made of MDF material and must be replaced when wet while solid wood base can often be salavaged and reused. It is critically important to have updated equipment to be used when performing water damage restoration. This is an hour meter from a Drieaz 7000 xli Dehumidifier. Once the dehumidifier is setup we record the hour meter in our proprietary software. We return to the home or business each day to monitor the materials that we are drying. During this documentation process we record the hour meter. It is imperative that the dehumidifier run 24/7/365 until the job is 100% dry. The dehumidifier is designed to remove moisture from the air. 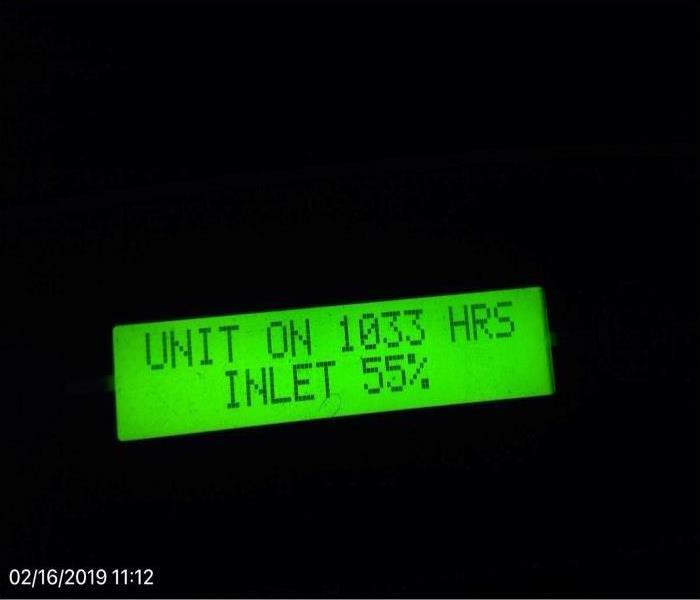 If the hour meter doesn't add up to the run time since our last visit we know that it has either malfunctioned, had a power outage or someone turned it off. Containment is used to close off the attic following the ceiling demolition so that we have a closed drying environment for the water loss. This is discussed through our IICRC training for our industry. 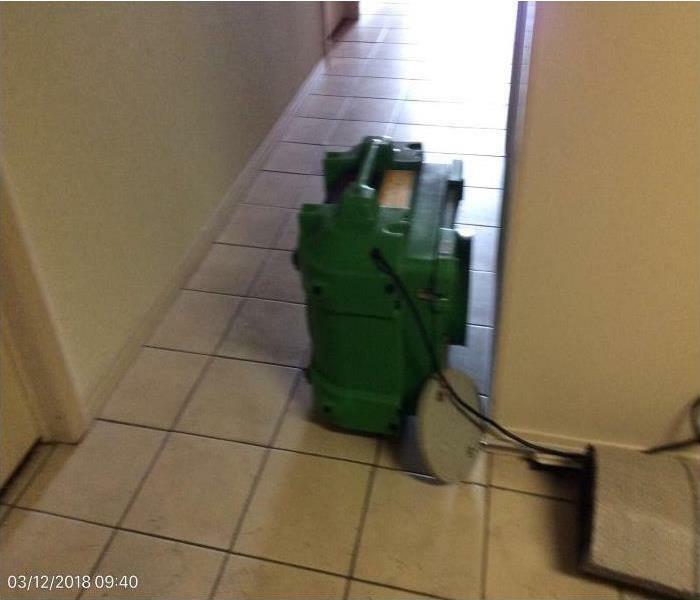 Walls are being dried with airmovers and a dehumidifier. In some cases in is not necessary to remove base trim but every job is different. We use our moisture meters to find all hidden moisture. Soot is shown on our dry sponge during test cleaning so we know what areas must be cleaned. This is a critical pre-testing stage prior to beginning any smoke damage loss. Smoke damaged caused by electrical fire. This job will require many services that we provide from cleaning to reconstruction. 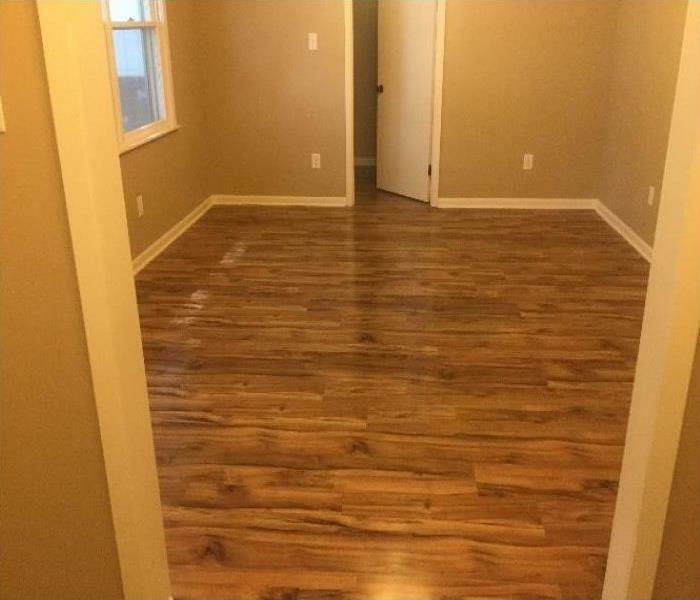 A variety of services were performed with this claim to include new walls and flooring. 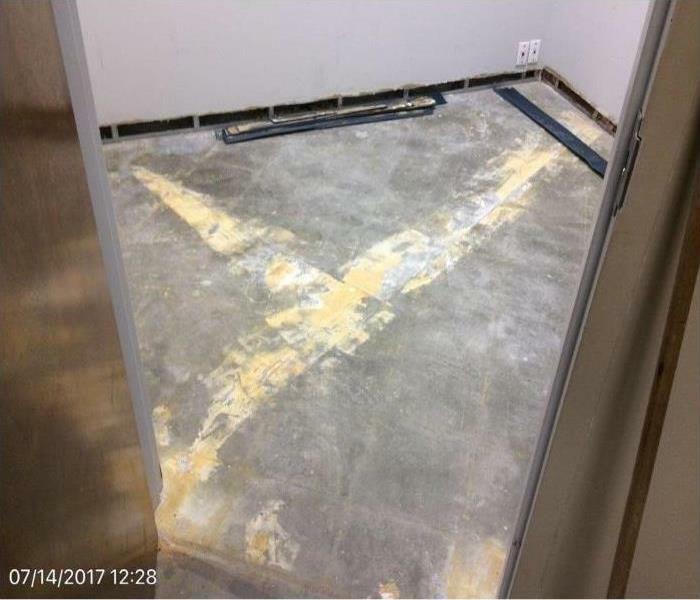 New floor installed following insurance claim. By using SERVPRO of Jonesboro for a turn-key project our customers are saved the time of having to find multiple companies for their loss. Job is awaiting demo for damages following insurance claim. This was a wonderful project following a devastating fire loss. While there is much grief initially by our customers we are so happy to offer full service. The end result is generally an upgrade to their home. Demo being completed of drywall ceiling and insulation following a fire loss. All rooms were gutted in this loss. 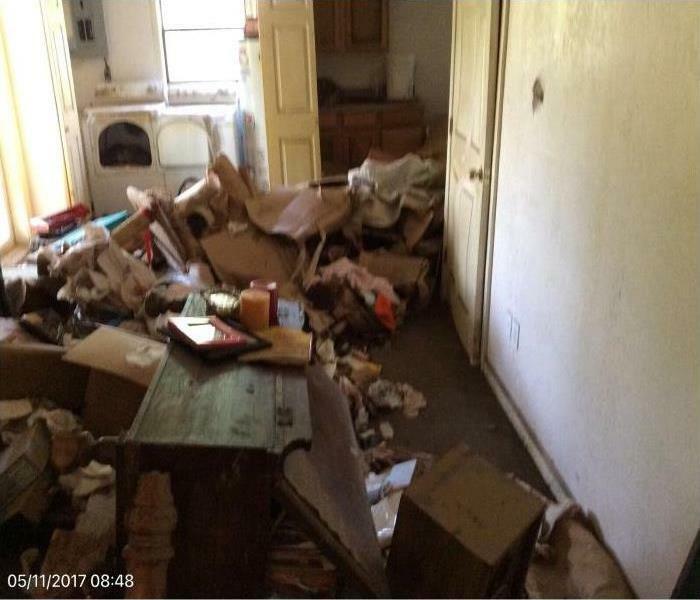 While it appears to be a mess there were no contents in the home. 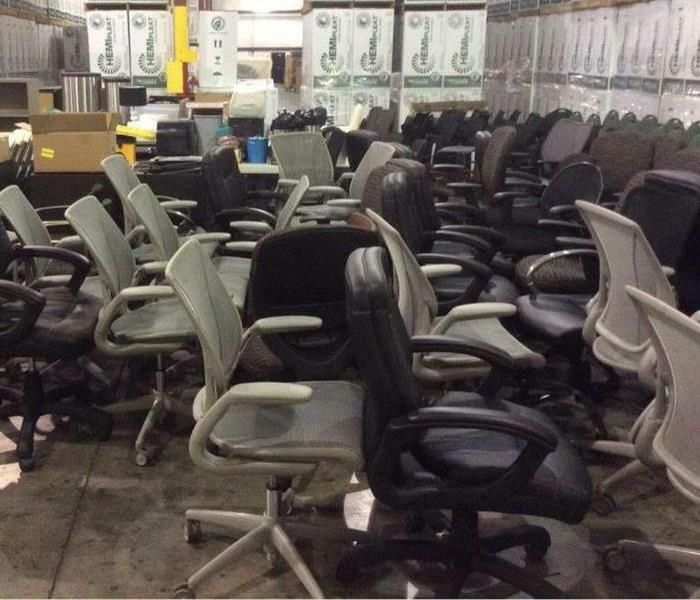 All contents had previously been packed out for cleaning at our warehouse. 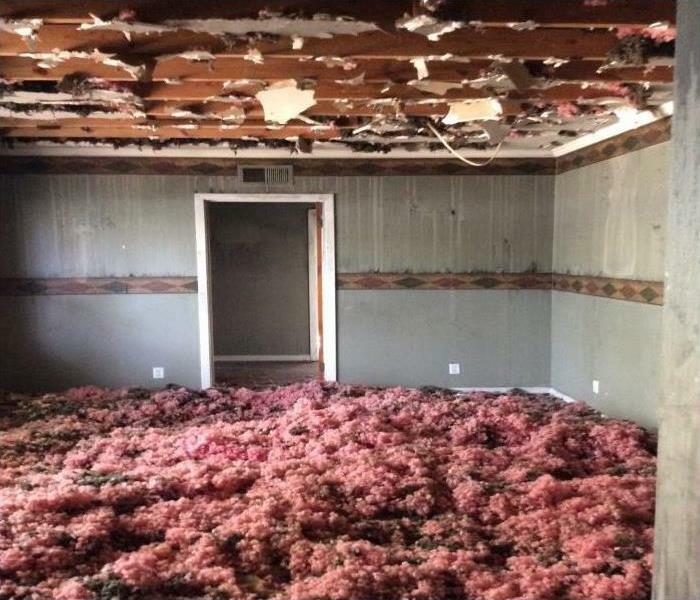 This room included new drywall ceiling and attic insulation. Smoke Sealer applied to attic wood framing following fire damage in Osceola, Arkansas. Many people are afraid that the smoke odors will continue after interior repairs are made. It is so critical to know that most of the time when soot enters an attic that the wood framing must be attended to. We are able to seal all wood framing to eliminate any residual smoke odors. Most of the time this also includes new attic insulation. 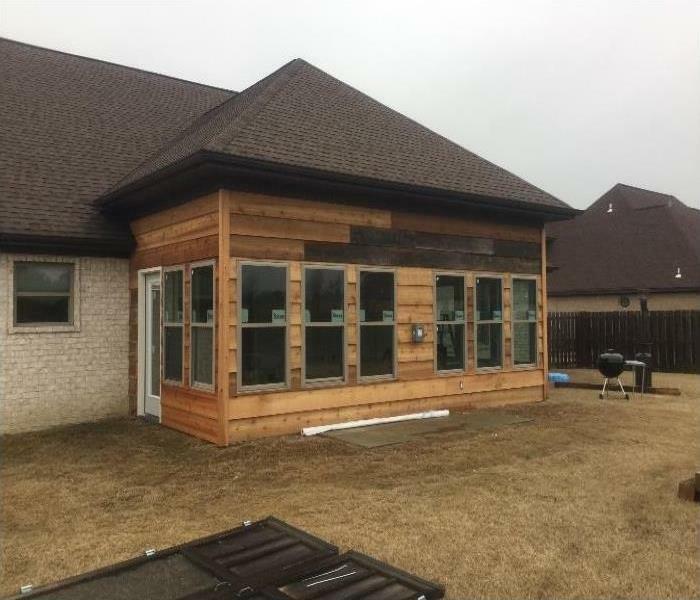 Customer in Trumann, Arkansas hired our reconstruction team to complete a sunroom addition. This was a beautiful project not associated with an insurance claim. Yes, we can perform all your home remodeling projects. 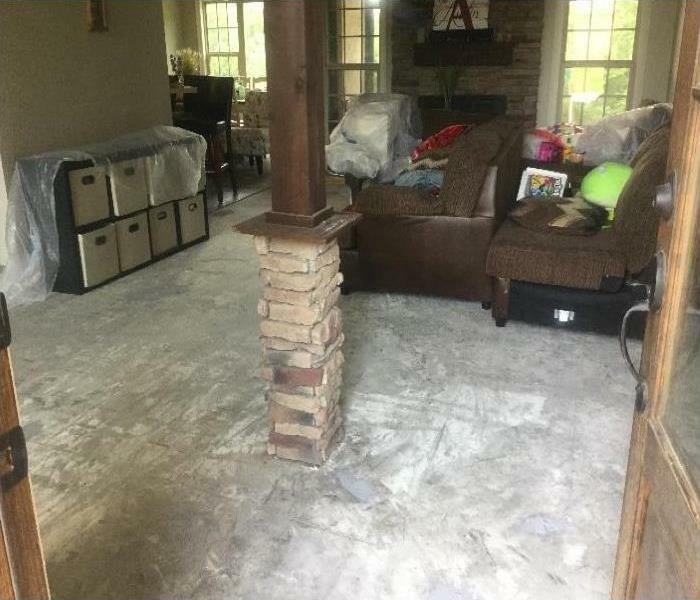 Engineered wood flooring removed, which was glued down, to prep concrete for new wood floor installation following a water damage in Jonesboro, Arkansas. We can handle all repairs that result from your insurance claim. Cold temperatures caused many frozen pipes this year that led to multiple water losses in Jonesboro, Arkansas and surrounding cities within North East Arkansas. 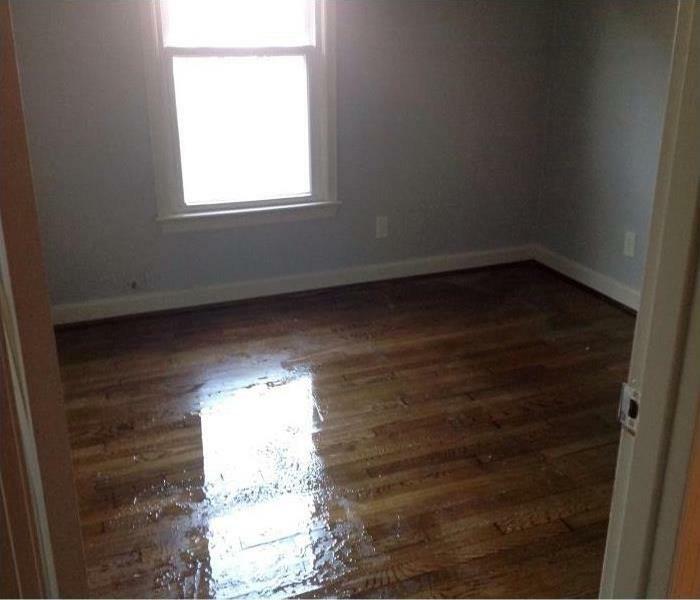 As you can see water damage can affect many materials and even that precious hardwood flooring. It is imperative that immediate steps be taken to remove the excess water and begin drying the hardwood. 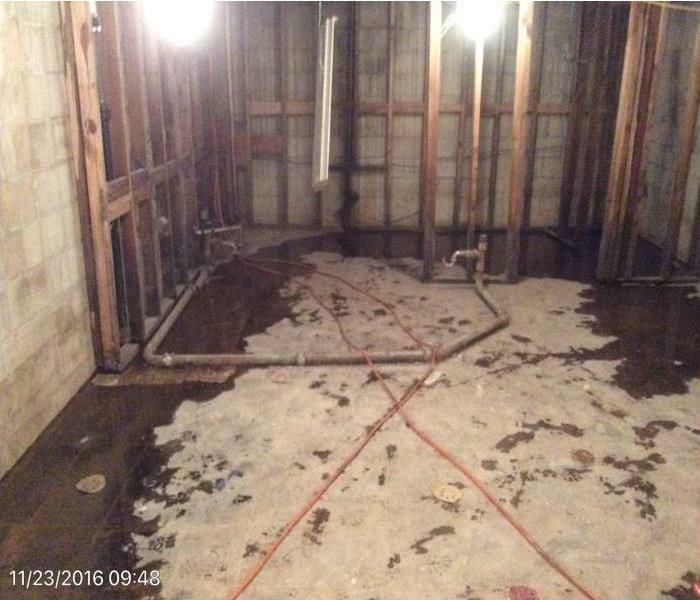 What can begin as a known issue of water intrusion can often lead to disaster if left unattended. 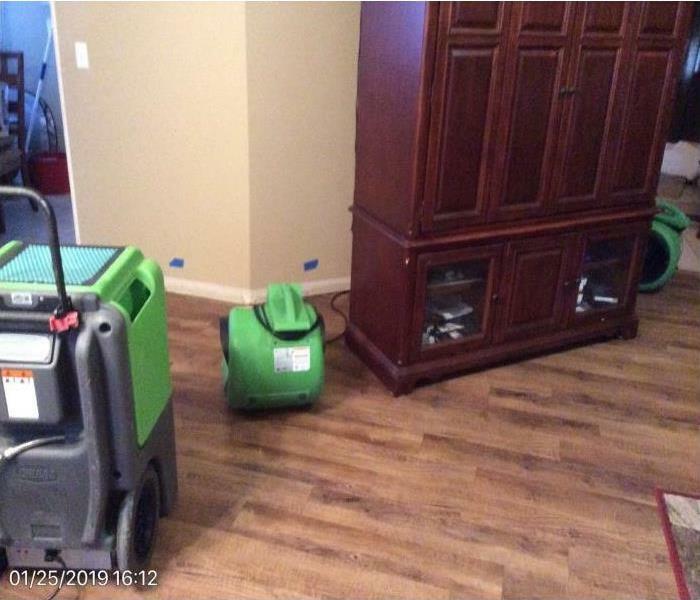 When you notice water inside your home please take the time to repair the source causing the damage and either cleanup the water yourself or call a professional like SERVPRO to handle the job. Even as much as 72 hours left unattended can cause secondary damage to what was unaffected materials or mold growth. Had the water damage been addressed in the beginning there may not have been a need to remove so many porous materials. Often not thought about but an ice maker line can leak and not be seen for weeks or even months. These are mostly slow leaks but sometimes can rupture and be seen immediately. When pulling your refrigerator out for routine cleaning be sure that you don't move it too far. Some of the ice maker lines are rather short. Be certain on the distance you can move the appliance to prevent turning a happy cleaning moment into calling your local SERVPRO franchise. 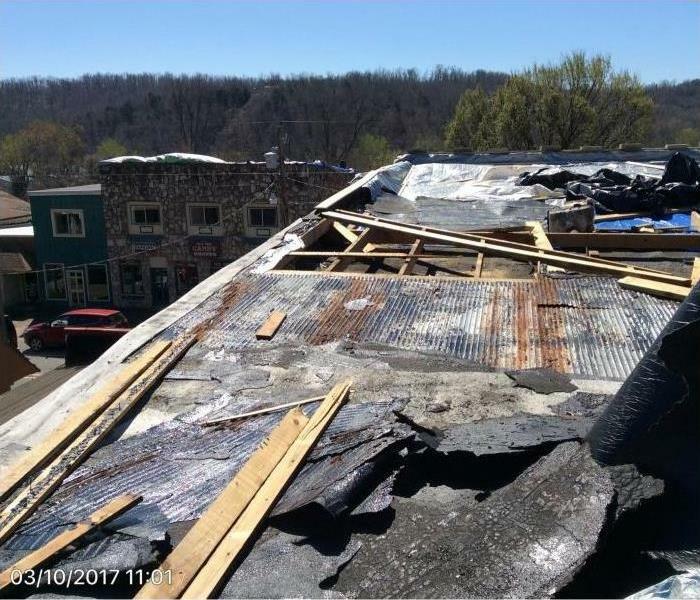 As storms rolled through Hardy, Arkansas the roof of this building was severely damaged. While we don't do commercial roofing we were called to address the large amount of water that entered the structure. Two floors of water damage affecting multiple rooms. Many structural materials were damaged and had to be removed followed by drying the structure. This is the result of a flood job near Pocahontas, Arkansas in May 2017. As 6-7 feet of water intruded this level of a home you can see clearly the effects of a heavy rain storm. The contents were destroyed and the entire structure of porous materials had to be removed. Once all demo was completed we were able to dry the wood framing and concrete walls/flooring using air movers and dehumidifiers. While working on a normal clean water loss we sometimes run into unexpected mold growth. 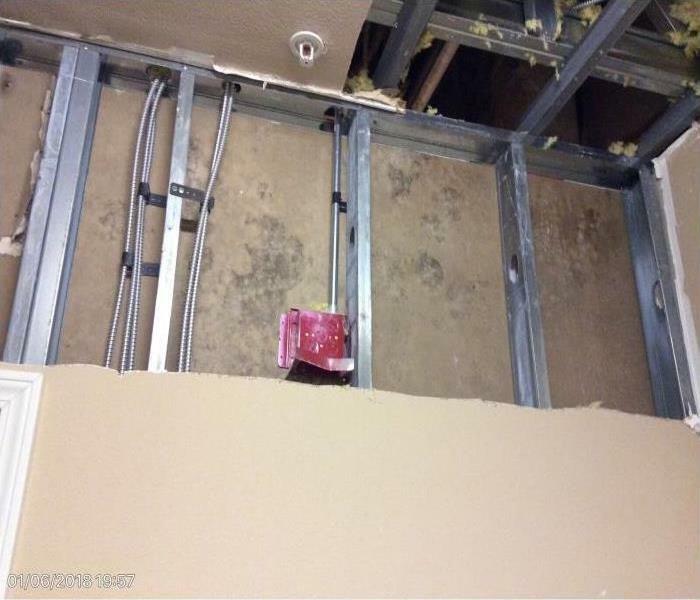 In this scenario we found that in a mechanical room there must have been issues controlling the humidity levels that cause mold growth on the drywall. We know that the mold didn't result from the water loss we were called to based on the time frame of the loss date. 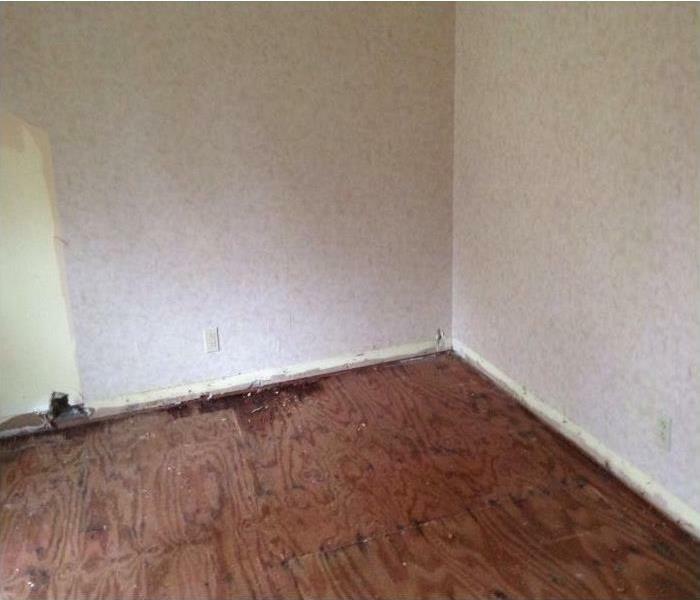 We found mold growth and had to change course and direction on proceeding with the job. We used containment at this point to prevent the spread of mold spores to unaffected rooms of the building. After discussing with the customer we were asked to proceed and handle the job professionally and correctly. 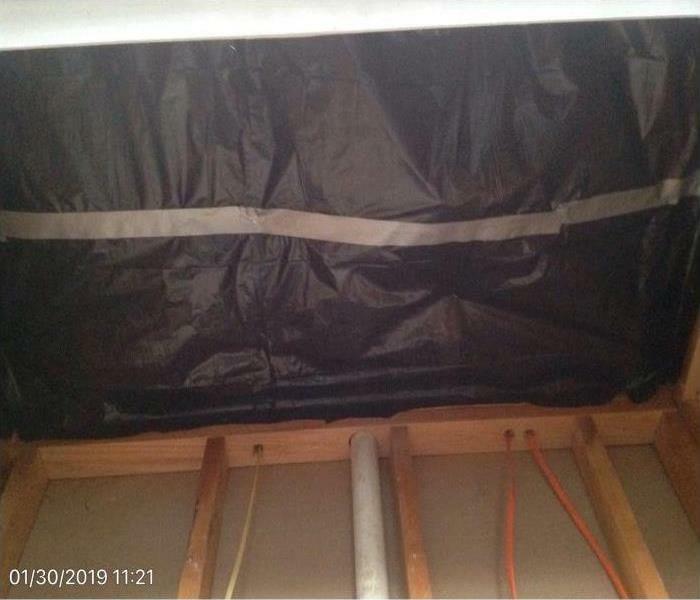 I'm personally opposed to installing insulation in a crawlspace as it can trap and hold moisture against the sub floor. Sometimes leaks can go unnoticed especially if it's a slow leak or a leak between the floors. 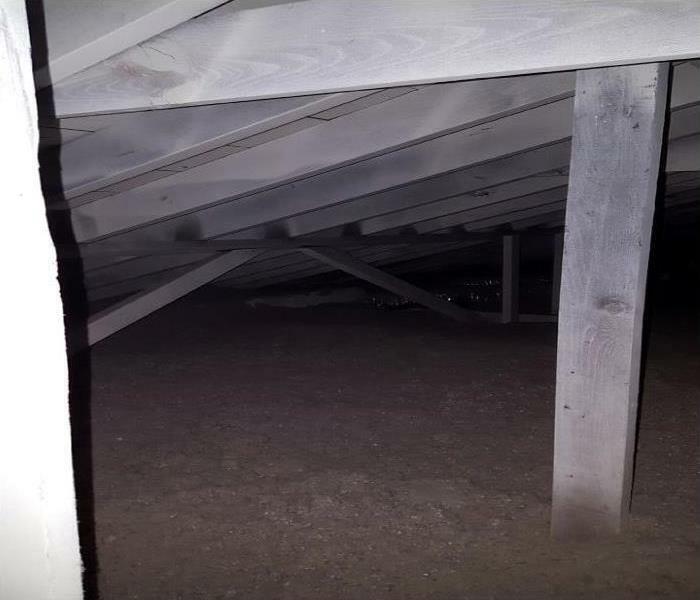 In this photo we describe a slow ongoing leak that the customer didn't know about for months until someone was working in the crawlspace. 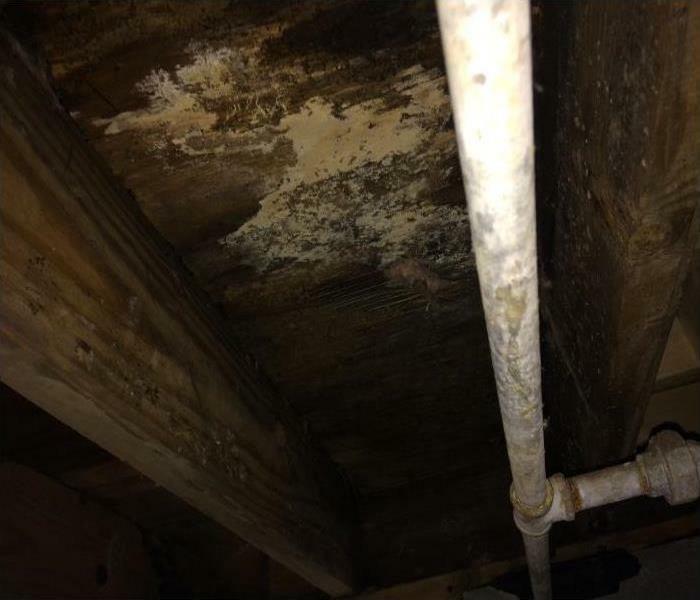 By the time the leak was discovered much of the insulation had fallen and mold growth had begun on the underside of the sub floor and joist. Sometimes, slow leaks with signs of mold and rot are not covered by you homeowners insurance policy. Inspect your crawlspace often and address any leaks right away. Mold can be found in many places. Often times a customer thinks the mold that they can see is all there is. This photo proves that once the drywall was removed we can see the presence of mold on the backside of drywall for the opposite room. All mold must be removed to complete a thorough mold remediation project. 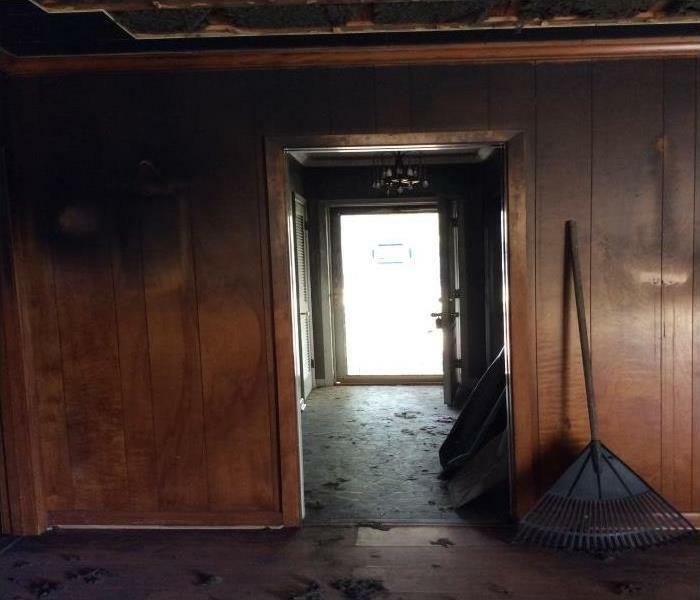 We were called to a commercial office building in Jonesboro, Arkansas following a fire damage. The fire was on the exterior of the building but burned into the interior. While there was no soot in the building there was an odor. 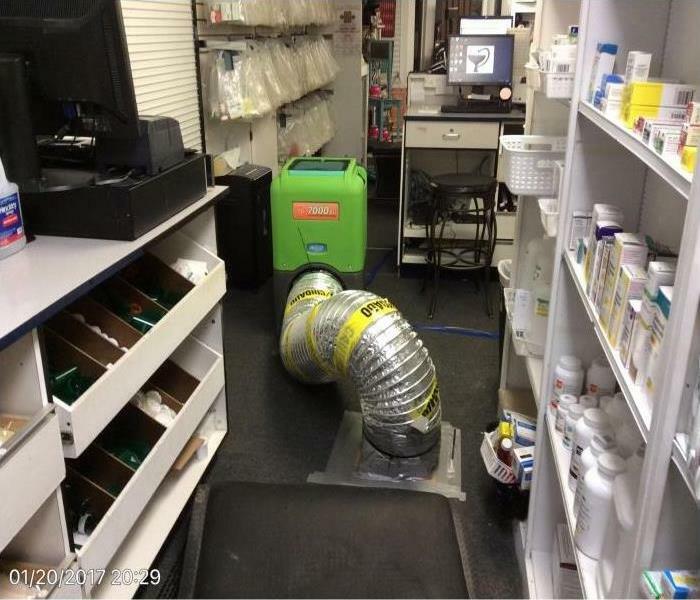 We placed two air scrubbers with HEPA filtration along with activated charcoal filters to assist with the odor removal. While the air scrubbers helped eliminate some of the odor unfortunately the odor still persisted after a few days. The customer was hopeful and willing for us to attempt the odor removal even prior to making repairs to assist the tenants of the building. This is a good reminder that while we have the tools and equipment to make commercial fire damage "Like it never even happened." the source of the odor must first be removed. Working at a Pharmacy in Osceola, Arkansas we had to be creative to limit their business interruption. Most Pharmacies have a built in platform in the Tech area. Water migration intruded the air space beneath the platform and had to be dried. We were able to use injected airflow machines and the heat ducted from the dehumidifier to successfully dry beneath the platform. It's the damage you can't always see! Mold can often be referred to as what we can see is the 'Tip of the Iceberg." As you can see once the drywall was removed in one room we were able to see that the adjoining room was also affected. Mold situations are hard to estimate and know upfront all of the work that may need to be completed. 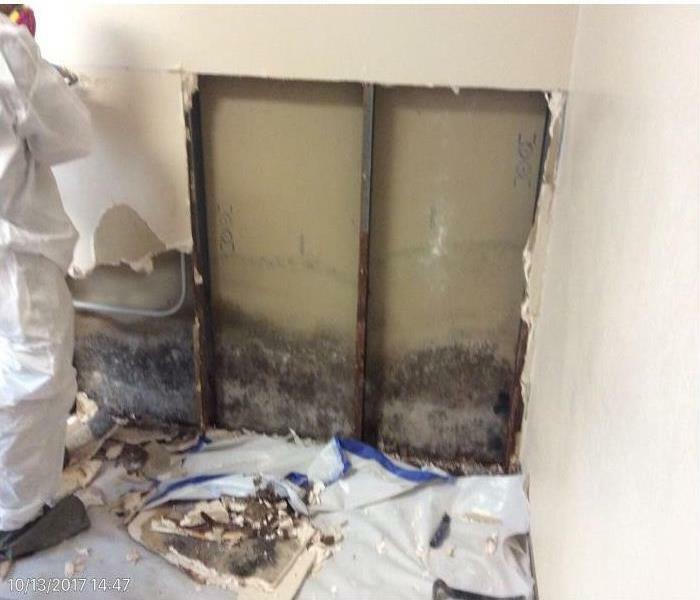 We always go 2' beyond the last visible mold to ensure there isn't more in the wall cavity. Our employees always wear PPE for health and safety reasons during mold remediation projects. We are sometimes called upon to clean contents and specifically upholstered chairs. Our cleaning process provides the customer with a thorough clean and disinfected item. With high traffic and many employees commercial contents need to be cleaned periodically. In a commercial setting business interruption is a major concern. In the photo attached we needed to extract water from the C-Channel metal framing. 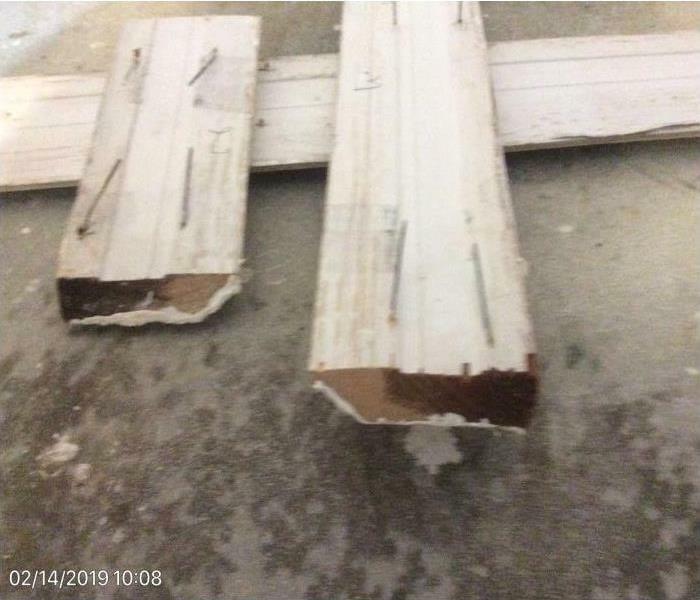 We were able to only cut the drywall at the height of the base trim to minimize the customer's interruption but also save them on repair cost. 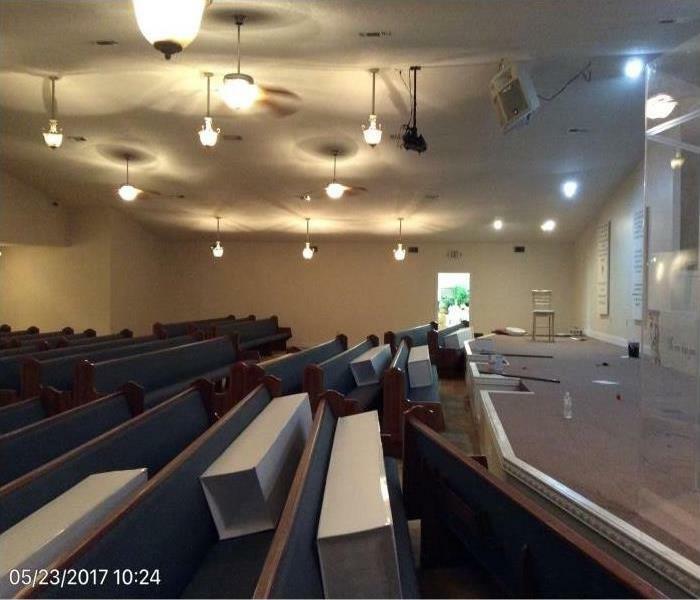 In May of 2017 a local church in Pocahontas, Arkansas called us to professionally cleanup the severe flood damage that their building sustained. We completed the demolition of all non-salvageable materials and disinfected all salvageable contents and framing. After the building was successfully dried we returned the key so that they could begin their own reconstruction efforts. Crew is leaving office headed to complete an emergency board up in Blytheville, AR. Job consisted of boarding up three door entries and three windows. We offer board up and roof tarp services in Jonesboro and surrounding areas. We now have a product that allows us to remove smoke residue from brick and block surfaces. 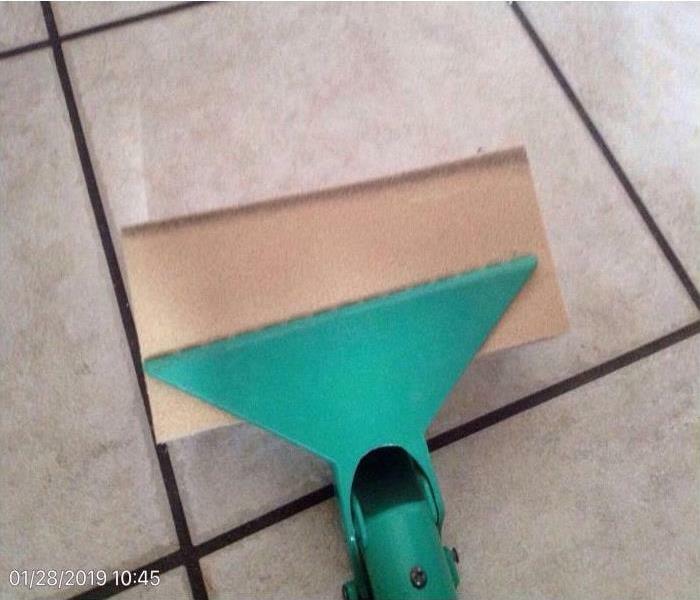 This product is sprayed onto services and allowed to dry. Once the product is ready you simply peel it away from the surface. This photo shows a major before and after difference. The left side is smoke residue that has yet to be removed. 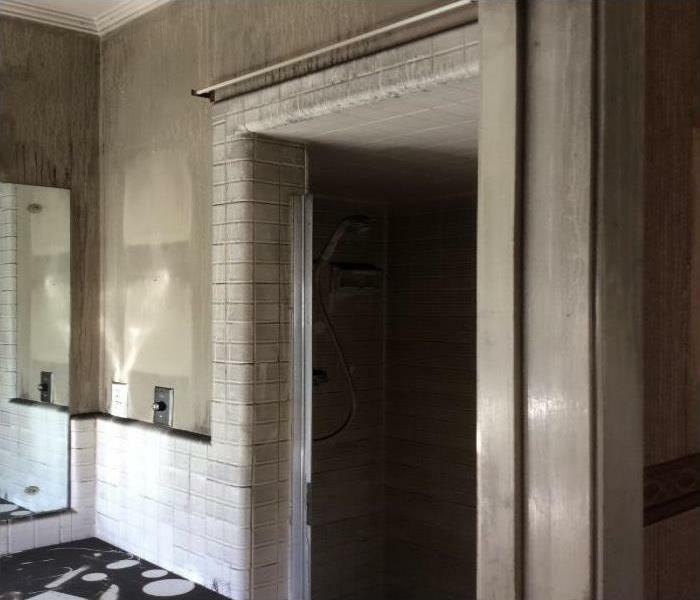 The middle of the photo is an after view once the product has been peeled away. The right side shows the product awaiting to be peeled from the surface. We offer full residential reconstruction services. We keep this vehicle magnet on our construction vehicles to assist with hiring subcontractors. If you know anyone who has trade experience in drywall, siding, cabinetry, painting, carpentry, flooring, etc. please have them call our office at 870-934-0501. SMR and Production Crew met at the Paragould Bowling Alley to sell the fire damage cleanup. We ended up placing drying equipment such as dehumidifiers and air scrubbers. We finished completing all task the building owner allowed which consisted removal and cleanup of all fallen and burned debris and water extraction. We were very thankful to be able to work with the Paragould School District to offer cleanup services from the fire on July 6, 2016. Appx 60,000 sqft of classrooms, offices, common areas and a gymnasium were all affected with soot and/or water damage. With the assistance of our Disaster Recovery Team we were able to fully clean the building in appx 22 days. Some cleaning was completed alongside the schools reconstruction contractor but did not slow down our teams. Production Manager and Estimator just completed a walkthrough of the facility from a roof leak. Production crew was called within a couple hours to extract, remove wet materials as needed and setup drying equipment. After two days of drying we removed all equipment and cleaned the carpet. Crew is gathering supplies needed to begin water extraction and setup temporary power distribution for drying services. We had several employees show up a this loss within a couple of hours of our site visit. We were on a limited time frame so work had to begin immediately.